On 8 December 1845 a marriage took place between James Price, 23, bachelor, draper, otp (of this parish), father Thomas Price, farmer and Jane James, 21, spinster, farmer, otp, father John James, in Grosmont, Monmouthshire witnessed by John Broome and Wm James. Grosmont is near the Herefordshire border. In the Hereford Journal the marriage was briefly listed as being between Jane James and Mr Price of Llanvihangel Crucorney. James Price was not in Cwmyoy, Llanvihangel Crucorney or Grosmont in the 1841 census. In all subsequent censuses our James Price's birthplace was given as Cwmyoy, Monmouthshire. However, his age is generally reduced by one-two years, as is Jane's. On the 27th September 1846 there was a Grosmont baptism for Mary Jane Price daughter of JG and Jane Price, otp, shopkeeper. The birth certificate shows that Mary Jane was born on 29 March 1846 to James Price and Jane Price (formerly James) with James a Grocer and Draper of Grosmont. Son John Walter Price was christened at Llangattock Lingoed on 10 October 1847, father James a farmer. By 1851 the family were in Somerset Street, Brynmawr, Llanelly, Brecknockshire where James, aged 27, born Cwmyoy was an iron and coal miner with wife Jane, born Grosmont, aged 26. They have three children: Mary Jane Price, 5, born Grosmont; John Walter Price, 3, born Llangattock; Gertrude Price, 1, born Llantilio Crossenny, Monmouthshire (probably baptised on 24 February 1850 to a John (sic) and Jane Price). .
Anne Isabella Price was born to James (a weigher) and Jane Price of Tredegar Road, Rhymney on August 15 1852, was baptised September 25 and died March 3 1854. In 1861 they had moved to Cloth Hall Row, Forchaman (Aberaman), Aberdare, Glamorgan. James was a coal miner and three more children had arrived: Thomas J. Price, 6, born Tredegar; Isabella S. Price, 3, born Aberdare; William H. Price, 1, born Aberdare. In the 1871 census they were at 71 Hill Street, Rhymney with James a grocer. Elvira Bridget Price was added to the family, aged 4, born Dowlais - a name that does not appear in any other context, but there are several named Elizabeth in the correct registration district. Isabel and William Henry have their birthplaces shown as Mountain Ash. No 71 was in the occupation of a William Thomas in 1874 when it was advertised as having a rental of £7 3s. In 1872/73 the affairs of a James George Price, grocer of 57 Cardiff Road, Mountain Ash, parish of Llanwono, were liquidated. See London Gazette, October 25 1872 and London Gazette, January 24 1873. Was this our James Price? These premises were occupied by grocer Alexander Edwards in 1871. He went into voluntary liquidation with a first meeting of creditors listed in April 1872. 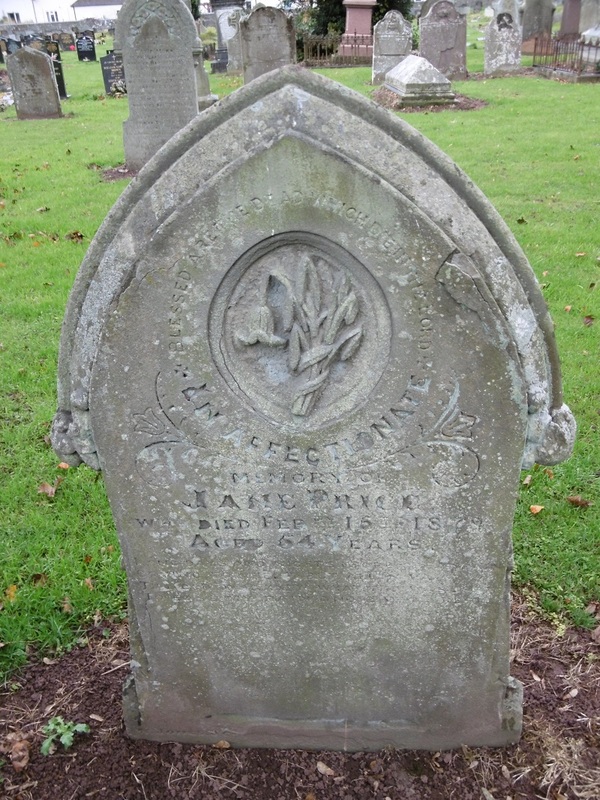 Jane Price died on February 16 1878, aged 54, in Back Street Brecknock (Brecon) of Carcinoma, wife of James George Price, Draper, the informant being Tom James Price who was present at the death. Mary Jane and John Morris married on August 9 1869 in Merthyr Tydfil witnessed by James Price, a weigher. John Walter Morris (1970-2 May 1925) was baptised on May 17 1870 to John and Mary Jane Morris of Williams St, Twynyrodyn. John's profession was shown as Tailor. In 1871 John W. Morris was listed as the son of Mary, 25 born Hereford, Grosmont and John Morris, 29, Filler Iron Works, born Llangeitho, Cardiganshire living at 9 Williams St, Merthyr Tydfil. A Mary Jane Morris died aged 32 in Merthyr Tydfil (Dec Q. 11a 264) in 1878. In the 1881 census John W., 11, was still living with his father, a widower and tailor at 87 Twynyrodyn, Merthyr Tydfil, with Rees Morris, 9, Frederick Morris, 6, William David Morris, 3, and a servant, Mary A. Nicholas. Fred Morris died in 1895. John W., 31, outfitter clothier, was at 64, High St, Merthyr Tydfil in the 1901 census (he had been with his uncle William Henry Price in 1891). On April 17 1894 he had married butcher's daughter Lucy Maria Robottom (1870-1933, born Merthyr Tydfil). Morris-Robottom.-April 17th, at Hope Chapel, Merthyr, by Rev. D. C. Edwards, M.A., J. W. Morris, outfitter, Pontmorlals, to Lucy, second daughter of Mr J. Robottom. 27, Victoria-street. No cards. (Cardiff Times April 21 1894. He also operated a business in Aberdare until 1907. In 1911, 16 years married, John Walter Morris, 41, described as dealer gents outfitter railway, and wife Lucy Maria, 41, have two sons Joseph Frederick Morris, 11, and John Thomas Morris, 6. They were living at Bron-y-Garth, Merthyr Tydfil. John Walter Morris died in 1925. Joseph Frederick Morris died in Poole, Dorset in 1973. A property sale document (April 2004) for 66 High St, Merthyr Tydfil lists a deed of grant for June 1 1937 from J.F.Morris and J.T.Morris to Montague Burton Limited. (See http://www.alangeorge.co.uk/High%20Street.htm for old photos of the High Street). BUSINESS CHANGES - The premises at :39, Commercial-street, Aberdare until recently occupied by Mr. J. W. Morris hatter and hosier, have again been leased to him, and the shop will be re-opened in the course of a few days with a choice assortment of new goods. The business will be under the sole management of Mr. W. D. Morris. In 1909 William David Morris married Elementary School teacher Ettie Eleanor Griffiths (June 24 1879-1955) born Aberdare. John Ellis Griffith Morris (1910-1993), married Heulwen Brewer (1916-2001) in Wandsworth in 1938. David Walter Morris (1912-2003). See this article written by him in 1996: ABERDARE BOYS' COUNTY SCHOOL A FORMER PUPIL REMEMBERS THE 1920s and also ABERDARE IN THE NINETEEN TWENTIES. A walk through part of the Town. He graduated in Southampton and taught at the primary level, eventually becoming head of a school in Pulborough, West Sussex. In the 1851 and 1861 censuses with parents. A John Price of Hill Row, Rhymney aged 23 was buried on March 3 1869. Was this him? Gertrude married David Jones on May 15 1872 in Bedwellty witnessed by her father, James George Price, grocer. In 1881, Gertrude was head and described as a 'carpenter's wife', born Monmouthshire Dingestow, with children: Margaret Jane Jones, 8 (born Mon, Rhymney), Anne Emily Jones, 6 (born Mon, Rhymney, 1874), Marion Jones, 4 (born Ferndale), and John Walter Jones (born Aberdare; June Q 1880-Jun Q 1881). Their address was 35 Curre St, Aberdare. In 1891 they were at 43 Brecon Road, Cyfarthfa, Merthyr Tydfil with daughters Mary J aged 19, Anne E aged 17 and Isabella, 7, all recorded as speaking Welsh only with the children born in Merthyr Tydfil. In 1901 Gertrude and David Jones (a timber sawyer, born Newcastle Emlyn, Carms), 50, were living at 18 Stuart St, Merthyr Tydfil, with daughters Maria Jones, 22, general servant (domestic) born Ferndale and Isabel Sarah Jones (28 January 1885-1965), dressmaker's apprentice, also born Ferndale. All spoke both languages. A Gertrude Jones died in Merthyr Tydfil in Mar Q 1905 aged 54. In 1911 widower David Jones was living with single daughter Maria Jones (34) at 7 Glynn Terrace, Merthyr Tydfil. He indicated that he had 7 children of whom 4 were still alive. Isabel married blacksmith William John Webb (16 December 1870-1940) in Sep Q. 1908 and had Hilda Gertrude Webb (26 June 1909-1998). In 1911 they were also at 7 Glynn Terrace, Merthyr Tydfil and were there in the 1939 Register. Hilda married Henry John Lewis (20 February 1907-1986) in 1931. They were at 7 Glynn Terrace in 1939 with daughter Isabel G Lewis (22 September 1933- ). Thomas James Price (Tom) and Rosa Madia Thomas were married on August 7 1880 at the parish church in Llanfihangel Talyllyn giving his father as James George Price, grocer. Isabel Price and W H Price were two of the witnesses. In 1881, Thomas Price, 26, was living at 3 Cobbs Cottages, Llanfihangel Talyllyn, Breconshire with wife Roza M., 25, born Llanfihangel parish, infant daughter Mary I. Price and Thomas' sister Isabella S. Price, 23, a servant (out of place). Thomas James Price and Rosa Madia Price established a home at Wern Cottage, Llanfihangel Talyllyn. Tom Price was a railway engine driver. More about the extensive descendants of Tom James Price and Rosa Madia Thomas. She was a visitor in the household of William Reed, a butcher in Wolverhampton in 1891. His wife, Elizabeth had been born in Dowlais. In 1901 she was listed as Sarah Price a cook aged 41 in the household of Charles Griffiths in West Bromwich. By the 1911 census Isabel Sarah Price was shown as a 50-year-old Cook Domestic in the household of Frederick Mills in Birmingham. A death is recorded in June Quarter 1915: Price	Isabel S	57	W. Bromwich	6b	990. In the 1881 census, William Henry Price may have been a grocer's assistant to Elijah Singer at 10-11 Queen St, Cardiff (age and birth location match). In 1891 William H., 30, provisions merchant, was living at 58 Upham Park Road, Chiswick with wife Kate Harries (September 16 1884-January 27 1942) born Islington and two nephews: Albert Lynch, 5, born Cardiff, scholar and John W. Morris, 21, a Tailor's Cutter, born Merthyr Tydfil. By 1901 he and Kate, 34, had moved to 52 Napier Avenue, Southend, Essex where William Henry was 'Sup Provident Assistant London'. In 1911 they were at 126 High St Southend, when he described himself as a House, Land and Estate Agent. They had been married 24 years, with no children, Kate aged 46. A William Price of approximately the right age died in Romford District in Q1 1928 (needs checking). Elizabeth Gertrude Leek (11 September 1888-1950). Elizabeth Gertrude married John Dix (4 August 1880-1967, born Cheltenham, died Bromsgrove) in Kings Norton District, Worcestershire in 1920. They had William Dix (1921-1921). They were with William Leek and sister Rose at the Sweet Shop and Cafe, Hewell Road, Bromsgrove R D in the 1939 Register when John Dix was a gardener in private service and Rose a clerk. William James Leek (5 August 1890-1940?) born Rugby, Warwickshire according to the 1911 census. May have married Minnie Simmonds (31 May 1883-28 January 1964) in 1925. They were at 50 Gladstone Road, Birmingham in 1939 when William was a bacon curer. Annie Maria Leek (3 January 1896-1964) married Leonard Tyers (1893- 4 May 1952) in Kings Norton in 1917. They had Winifred Olive Tyers (30 June 1918-30 June 1945; died St Chads Hospital, Edgbaston, Birmingham) who was a typist/telephone operator in 1939. They lived at 12 Manor Road, Smethwick at the time of Leonard's death. She subsequently married Vincent Hughes in Merioneth in 1961. Rose Isabel Fanny Leek (29 December 1900-1980) who married George Adams in 1946 and subsequently John E Martin in 1976. She lived at Roseleigh, Fairfield Drive, Kinver, Staffs at the time of her death. Lilian Irene Leek (22 May 1904-1979) married Harold Frank Churchley (11 Dec 1906-1980) in Solihull in 1949. Previously, Lily Irene Churchley (nee Roe) (1907-1947) and builders foreman Harold F Churchley, married 1937, were in the 1939 Register, living at 166 Stroud Road, Solihull.